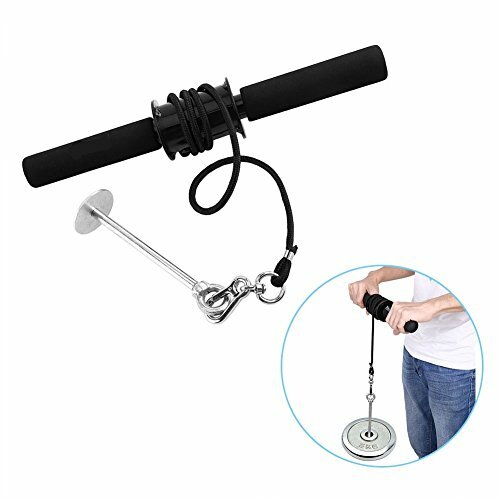 Wrist roller is a special and efficient strength training device for wrist and forearm. It consists of strong steel, foam grip and durable nylon rope. Its strong steel bar construction doesn't slip when use heavy weights and can work with all standard weight plates. With steel clasp can help you hang weight plates easily. The foam grip handles design can reduce hand fatigue and provide maximum grip. The maximum load-bearing capacity is 20 pounds, for professional athlete is about 15pounds. Monitors are not calibrated same, item color displayed in photos may be showing slightly different from the real object. Please in kind prevail. Strong steel bar construction doesn't slip when using heavy weights. Can work with all standard weight plates.The steel clasp design can help you hang weight plates easily. The foam grip handles design can reduce hand fatigue and provide maximum grip. A special and efficient strength training device for wrist and forearm.